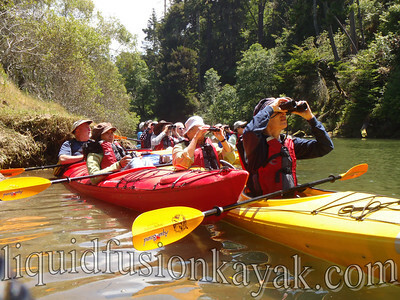 On June 25, Liquid Fusion Kayaking and the Mendocino Coast Audubon Society (MCAS) teamed up to offer a birding by kayak trip on the Noyo River. It turned out to be a fantastic day - warm and sunny with a great group of folks and lots of bird activity. Late spring/early summer is one of our favorite times of the year for birding because of all the nesting and breeding activity. 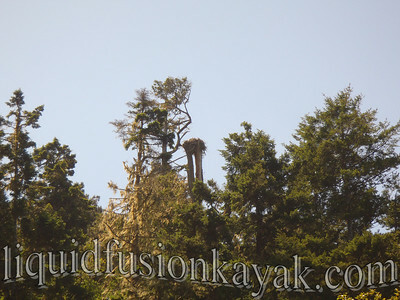 On our kayak birding trip, we were treated to lots of singing as well as observing some newly fledged belted kingfishers, common merganser ducklings, and an active osprey nest. For those that missed the trip or those who can't wait until next year to do the trip again, stop by and bird with us from our deck over the Noyo River at Dolphin Isle Marina. Lately we have been enjoying Downy Woodpeckers, Chestnut-backed Chickadees, Anna's Hummingbirds, Wilson's Warblers, and Black-headed Grosbeaks in the alder tree over our deck. 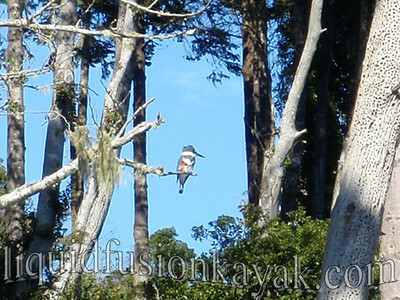 Or get out on the water and bird on one of our kayak tours or on one of our rental kayaks. 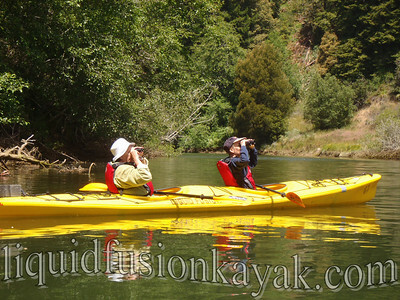 You can also check out our facebook page and our blog about birds and wildlife that we are seeing from our kayaks on the Noyo River and other Mendocino County waters including sea kayak trips in the ocean and whitewater trips on Rancheria Creek and the Russian and Eel Rivers. 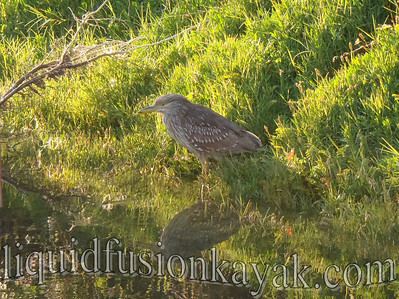 Here is a link to our photo gallery from the day and a list of bird species from our trip (please comment if I missed any): Pelagic Cormorant, Double Crested Cormorant, Black-crowned Night Heron (juvenile), Green Heron, Great Blue Heron, Canada Goose, Mallard, Common Merganser, Red-shouldered Hawk, Osprey, Western Gull, Mourning Dove, Band-tailed Pigeon, Stellar's Jay, Anna's Hummingbird, Acorn Woodpecker, Belted Kingfisher, Violet-green Swallow, Barn Swallow, Cliff Swallow, Rough-legged Swallow, Pacific-slope Flycatcher, Western Wood-Peewee, Black Phoebe, Chestnut-backed Chickadee, Black-headed Grosbeak, Swainson's Thrush, Orange-crowned Warbler, Wilson's Warbler, House Finch, Purple Finch, Goldfinch, and Western Tanager.